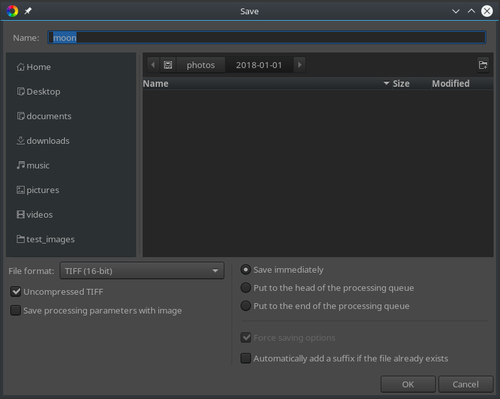 Saving images from RawTherapee can be done in several ways, the two most common of which are either saving the image immediately from the Editor tab, or adding it to the batch processing queue which resides in the Queue tab. Using the "Save immediately" feature will put your CPU immediately to work, and as a result, opening and tweaking other images in the Editor will be somewhat slow while the image is being saved. The queue mechanism allows you to put edited images which are ready to be saved to a virtual queue which you can start processing at a later time. Adding them to the queue is instant, so you can continue editing other images and making the most of your CPU for editing. Once you are done editing and putting images to the queue, you can flip the large "On" switch and go off to brew yourself a coffee while RawTherapee grinds away at all the images in the queue. The queue is persistent - you can exit RawTherapee and restart it later; the queued images will still be there. The queue can even survive a crash. When you are done tweaking an image in the Editor, click the "Put current image to processing queue" button . Also in the Editor tab, click the "Save current image" button and select "Put the the head/tail of the processing queue". Right-click on a thumbnail in the File Browser or the Filmstrip and select "Put to queue". Regardless which method you use, when you go to the Queue tab you will see your photos lined up, ready for processing (if you had the queue set to "Auto-start", it may have finished processing before you viewed it). The "Save current image" window. Notice the "Force saving options" checkbox, which is disabled in the screenshot because neither of the "Put to the head/tail of the processing queue" options are enabled. The Queue has several settings, such as the output file format and destination. These settings take effect in all cases except when you use the "Save current image" button , select "Put the the head/tail of the processing queue" and enable the "Force saving options" checkbox. In this case, the settings seen in the "Save" window will be used, and the ones from the Queue tab ignored. In all other cases, the settings from the Queue tab will be used. "Save processing parameters with image" will save a sidecar file alongside the output file, with the same filename as the output image but with a ".pp3" extension. This is useful when you want to save multiple copies of the same photo, each one tweaked a bit differently. Specify the output location based on the source photo's location, rank, trash status or position in the queue. %r will be replaced by the photo's rank. If the photo is unranked, '0' is used. If the photo is in the trash, 'x' is used. %s1, ..., %s9 will be replaced by the photo's initial position in the queue at the time the queue is started. The number specifies the padding, e.g. %s3 results in '001'. In the top-left corner of the Queue tab you will find an "On/Off" switch, and an "Auto-start" checkbox. If "Auto-start" is enabled, processing will start as soon as an image is sent to the queue. Usually you will not want this, as this will use your CPU for processing the photos in the queue leaving very little CPU time for allowing RawTherapee to be responsive while you tweak other photos. If "Auto-start" is not checked, you will have to activate the queue manually by hitting the "On/Off" switch. You can pause the queue by hitting the "On/Off" switch - RawTherapee will first finish processing the current photo. You can remove a specific image from the queue by clicking the small "Cancel job" button in the corner of each thumbnail. You can clear the whole queue right-clicking on a thumbnail and clicking "Select all" and "Cancel job", or by using the ^ Ctrl + a keyboard shortcut to select all thumbnails and then hitting the ⌦ Delete key on the keyboard. This page was last edited on 3 April 2019, at 14:15.